NB: Linked in this week's Friday's Forgotten Books, 3/5/13. 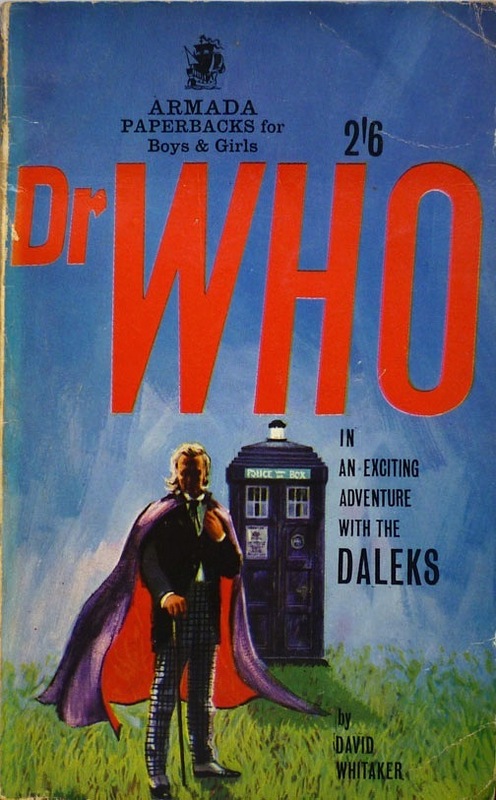 Dr Who in an Exciting Adventure with the Daleks (or Doctor Who and the Daleks if you prefer) is a novelisation of the second Who adventure, The Daleks (1963/4; it also shares its story with the first Doctor Who movie, Doctor Who and the Daleks, 1965, starring Peter Cushing... keep up at the back), but it's actually presented as if it's the first. 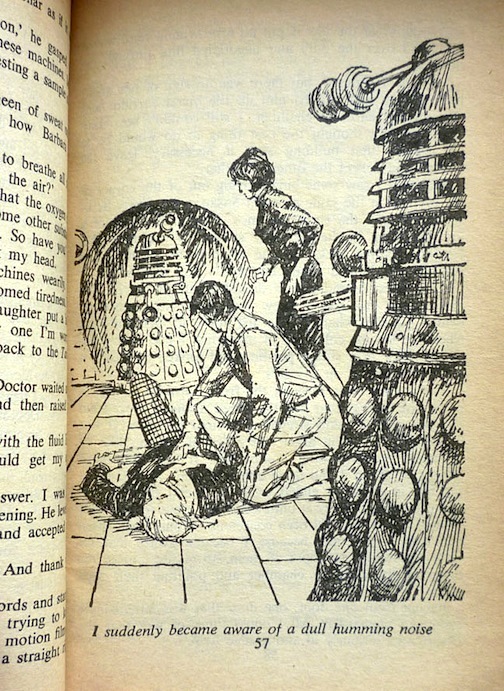 Whitaker's innovation was to concoct a whole new opening sequence for the novel detailing the first meeting between schoolteachers Ian Chesterton and Barbara Wright and the mysterious Doctor and his granddaughter, Susan. This originally took place in the debut Doctor Who episode, An Unearthly Child (1963), but Whitaker penned an alternate, eerie, evocative, notably gruesome opening in which Chesterton stumbles upon a road accident on a foggy night on Barnes Common involving Barbara, Susan and an unfortunate lorry driver, "hurled sideways at the moment of impact, the glass of the window shattering but holding him from being thrown out onto the roadway". "Is he all right?" asks a bloodied Barbara, to which Ian replies bluntly, "He's dead." 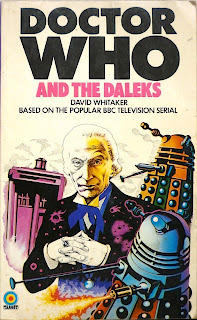 However, the chief novelty of Whitaker's novelisation is that it's written – quite well, as it happens – in the first person. 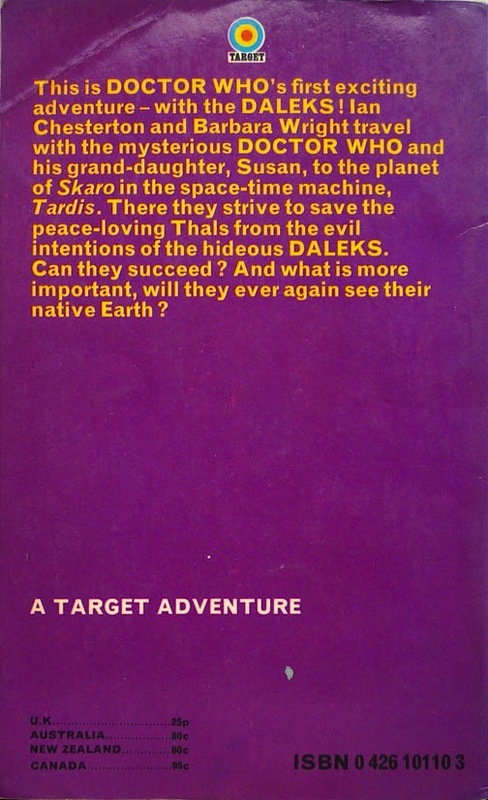 The standard style for all of the ensuing Who novelisations was third person, but this one is narrated by Ian Chesterton, who makes for an agreeably sceptical companion – both for the reader and for the Doctor. 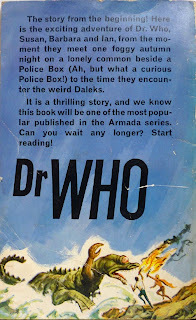 Indeed, much as I love many of the later third-person Who novels – Terrance Dicks' in particular (a few more of which I also found in that Brighton junk shop, to be unveiled in a future post) – first person suits the format rather well, affording an intimate perspective on William Hartnell's devious, irascible Doctor. 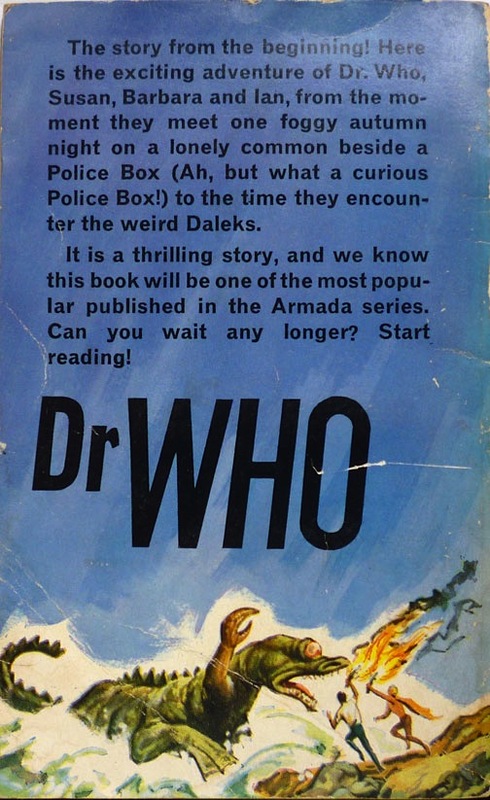 It's a cut above what one might normally expect of a novelisation, and a nice acquisition – or rather, pair of acquisitions – in this, the year of the 50th anniversary of Doctor Who. 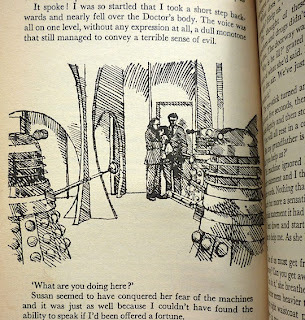 And hey: maybe one day I'll pass on one or the other of the books – and maybe some of the other Who paperbacks I've accumulated – to a small child, and perhaps engender the same enthusiasm for reading the Who books instilled in me as a kid. I read this a long time ago, it brought back some interesting thoughts. Thanks for bringing back the memories. My pleasure, Johnny. And Richard – Whitaker's Who novelisation is atypical, so you never know: you might enjoy the later novelisations more. I can heartily recommend Terrance Dicks' especially. 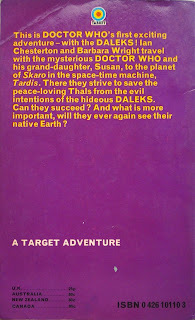 My how I loved those Target books! I think I very nearly had them all at some point in the mid-eighties, and then start collecting earlier editions for good measure. My favourites were always the Chris Achilleos versions. I can still remember scanning the small ads at the back of the local paper for the magic words 'Dr Who', and the heart stopping joy of acquiring a box full of rare old Target books and Dalek Annuals. Happy days! 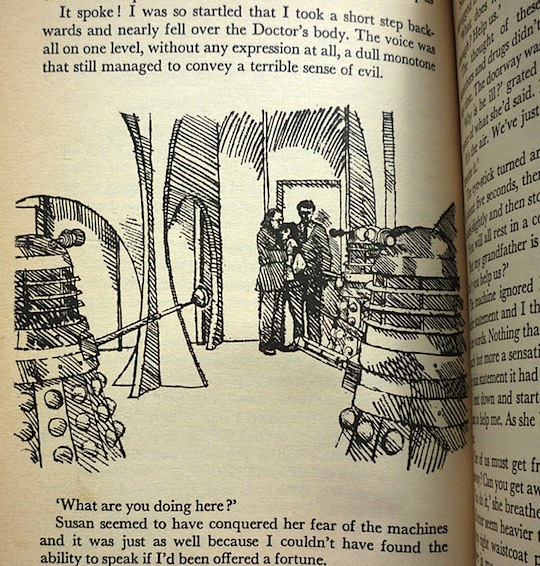 Incidentally Nick, as well as being some of the first novels I read and collected, they were also some of the first books to arouse my interest in graphic design, a field I went on to make a career out of. Two of the other series which I loved and collected at the time were the Pan Book of Horror set, edited by the wonderfully mysterious sounding Herbert Van Thal, and the Fontana Book of Monster stories, edited in its early days by R Chetwynd Hayes. More beautiful covers from what I think was a golden age in its way. Did you ever come across these?